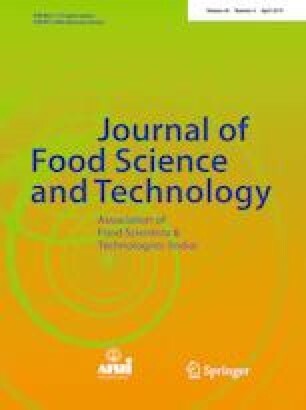 Vacuum impregnation of sugar syrup into sub-baric fried Gulabjamun was evaluated as a technological approach to prepare a product of most acceptable quality. Sugar syrup concentrations (40, 50 and 60 °Brix) in combination with process time (2, 4 and 6 min) were analyzed for their effect on product quality in terms of its overall acceptability, expansion ratio, hardness, juiciness and sugar content. The effect of the process conditions on the five listed responses during the vacuum impregnation process was evaluated using response surface methodology and modelled using a second order polynomial equation. The optimum combination was obtained as soaking in a syrup of 55 °Brix for 5 min and was experimentally validated for its real time adequacy. The experimental values of the quality parameters thus obtained were found to be in close agreement with the predicted values. The online version of this article ( https://doi.org/10.1007/s13197-019-03734-5) contains supplementary material, which is available to authorized users. The authors acknowledge fellowship and infrastructure received from ICAR-NDRI (SRS) to carry out the research work.